Nike is the world’s leading innovator in athletic footwear, apparel, equipment and accessories. If you have a body, you are an athlete and Nike’s mission is to bring inspiration and innovation to every single athlete in the world. With Nike+ the world’s most famous sporting brand is continuously pushing the boundaries of athletics in the new digital age. Founded in 2008, demodern is an independent design agency that creates innovative communication for the digital age. The three agency founders, together with 18 full-time employees, work with global brands like Nike, Edding and Montblanc. For their creative work demodern received numerous national and international awards, including Gold at the ADC Europe 2010 and two Golden Lions in Cannes 2011. Nike approached demodern for the development of a large-screen, multi-touch application for their flagship stores. The touchscreens should allow customers to immerse themselves in the world of the Nike product experience, and inform visitors about upcoming classes, events & activities in the surrounding neighborhood of the store. To make the media-rich project work, demodern had to find a way to allow Nike’s team to independently manage all the content for these digital walls. Imagine that you want to purchase a new running shoe and you could receive detailed user stories, social content as well as product information directly at the point of sale. This is what the team at Nike Germany thought; so they provisioned the digital agency demodern to develop an interactive multi-touch application as a communication channel directly at the point of sale. Only 3 months after the creatives at demodern went to work, a SportScheck store in Munich and the Nike flagship store in Berlin already had 75 inch multi-touch screens with the interactive app experience installed. “Besides social feeds, the project required us to integrate editorial stories as well as videos and location based information about upcoming events and virtual running trails, which have to be customized for each individual store”, says Alexander El-Meligi, who led the team at demodern. "Our goal was to focus on the immersive and rich user experience of the large in-store touchscreen. Instead of creating our own custom backend API and editorial system we decided to rely on Contentful, which has proven to be a perfect fit for the development of this new screen experience,” summarizes the experience Alexander El-Meligi. Where should content come from? Instead of trying to customize an existing content management system or building their own tool from scratch, demodern decided to use Contentful’s APIs. “We were amazed by Contentful’s Content Delivery API. Performance and reliability have been rock-solid. The integration of the API into Adobe AIR and the production of a working prototype took our developers only 2-3 days. Such short turnaround time would be unimaginable if we would have decided to create our own backend.”, notes Florian Mueller, the Project Manager at demodern. 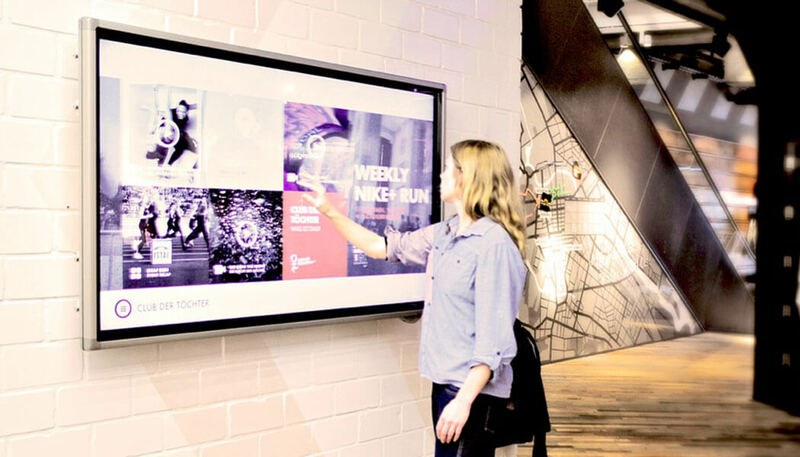 Nike interactive wall allows visitors to experience branded content in a brand new way. The new walls underline the relationship and identification power of the Nike brand and have a positive influence on the purchasing decisions of customers. They include the direct surroundings of the store and create a real hub for sport lovers and enthusiasts.